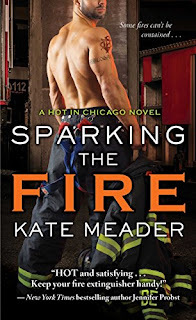 Actor Molly Cade, America’s fallen sweetheart, finally has her shot at a Hollywood comeback with a dramatic new role as a tough-as-nails firefighter that promises to propel her back to the big time and restore her self-respect. Wyatt Fox, resident daredevil at Engine Co. 6, needs a low-key job to keep him busy while he recovers from his latest rescue stunt. Consulting on a local movie shoot should add just enough spark to his day. Especially when in struts Molly Cade: the woman who worked his heart over good, and then left him in the Windy City dust. I am sad to see this series end. The Dempsey family has become a favorite. The anticipation for Wyatts story was well worth the wait. We got some glimpses of Wyatt throughout the other books but he was still a mystery. Wyatt and Molly spent a week together five years ago but never exchanged full names after their week of bliss was over they went their separate ways. Molly became a star and Wyatt went home to his siblings. Fate brings these too back together and they can't deny the spark. I love Wyatt and Molly together. They couldn't be more opposite but that what makes their story interesting. Through the drama and fear these two find themselves unable to stay away from each other. Molly's personality fits perfect with the Dempsey family and I loved her helping Wyatt to get closer to The newest member of the Dempsey family Roni. I loved this book and would recommend to others. I keep hoping we will get Ronis story next even though this is supposed to be the last in the series.